venturing into the unknown, again. i know woefully little about indian cuisine; i really do enjoy the food, but the opportunities to eat it are scarce in these parts--there's only one restaurant, and i don't really know anyone here who cooks or eats indian food on a regular basis. even when i was in los angeles, i rarely indulged in it, as there weren't (aren't) many good indian restaurants; it was only when i started visiting the uk and hong kong more that i discovered how exceptional and varied the cuisine could be. i've toyed with cooking some of the simpler dishes at home, and even purchased a couple of cookbooks, but nothing came of it. 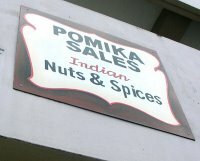 i've read through some of my favourite indian food blogs, but am still trying to get my head around all the regional specialties, the wondrous array of spices, and other exotic ingredients. lately, though, i've been coming across a lot of indian food. 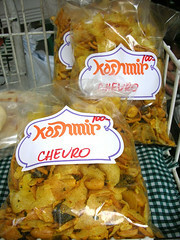 at the salcedo market there was a stall selling meat and vegetable-filled samosas, flatbreads like naans, parathas, and pappadoms, and a spicy snack mix called chevro. my blog trawls show that the evil jungle prince has been concocting some tasty treats, roboppy's been carb feasting in the east village, and barbara's been examining an interesting leaf. locally, my friend, ronnie, had offered a tasty three-course dinner menu at her resto, and i read in the paper about a new-to-me indian foods and spice shop on island. so i went to pomika sales, as mentioned in the article. it turns out that it is across the street from where i work, conveniently located adjacent to the golden motel (half-hourly and hourly rates available), inside meena's jeans for guys and gals (it's a clothing store--get your mind out of the gutter). 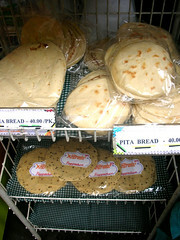 meena's has been around since the eighties, and it looks like most of the stock as been around since then too. not that there's anything wrong with that--i'm told the eighties are back in fashion. there are also some fabulous cheapie beaded ethnic-y boho clothes, but i'm not sure if there's any traditional stuff (if they did i'd been making a joke about sari-saris and saris that three people would get, and no one would laugh. okay, moving on). anyway, pomika is in the back, in a room that has never seen daylight, where perhaps the saleswomen have lunch during the day, and perhaps the local chapter of the fight club meets at night. it's a bit...dire, with just barely adequate fluorescent tube lights, a hodgepodge of bare, makeshift shelves and an alarmingly large display of outdated products (forty percent off). stock takes up about half the room, there's a small display of indian dvds for rent or for sale, and the saleswomen...are having lunch on the other side of the room. anyway, so what if the room reminds me of the movie "hostel"--the vibe is one of complete disinterest (one point in its favour), it is clean despite appearances (2 points), the inventory is surprisingly good (97 points), and very, very affordable (A+ for effort). i ended up buying a bottle of rosewater, some methi (fenugreek seeds), whole cloves, and a packet of mixed whole spices for garam masala, all for slightly under $5. although i bought all this stuff, i didn't actually know what i was going to do with it. it took j's post about her homecooked indian meal to spur me into action. unfortunately, one of the main ingredients--paneer--can't be bought on island. damn, skippy. what's a lactose craving island girl to do? 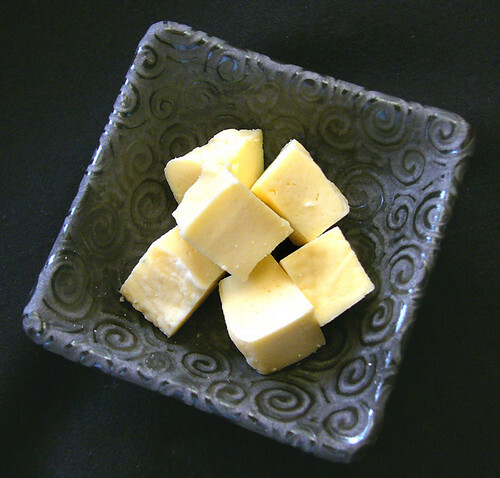 ah, blessed are the homemade cheesemakers, for they will blog. heidi, clotilde, and sam have all made ricotta cheese at home, and since that is what paneer basically is, i tried the same recipe they did, and goshdarnit, it worked. the only difference was that after squeezing out the whey, i kept it in its cloth and i placed it in the fridge overnight, under a weighted plate, to compress and dry out further. in the morning i had a fat slab ready to cube for my spinach dish. the saag paneer, was excellent (thank you, j! ), and much easier to make than i had expected. buoyed by a double success, i looked around the nets to see if i could find another recipe using the cheese. i found that paneer, if kept slightly softer with more liquid in the curds, is often used in desserts, so i set out to make two similar sweets that caught my eye: rasgulla and ras malai. since i'd never made either, i decided to read as many recipes online as i could find, then experiment with the most common directions amongst them. 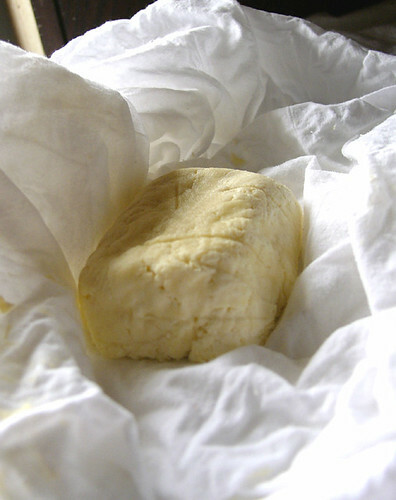 i again made a batch of cheese, but this time i didn't drain it as well as the previous batch, and instead of refrigerating it immediately, i kept it in the cloth, and kneaded it, to make it into a smooth dough. i shaped this dough into small walnut-sized balls, taking care to keep them as light as possible, then dropped them into simmering water. as soon as they puffed up a bit and floated to the surface, i placed them in a shallow dish. i poured a slightly-reduced simple sugar syrup, flavoured with freshly ground cardamom over them, then put them in the fridge to macerate overnight. 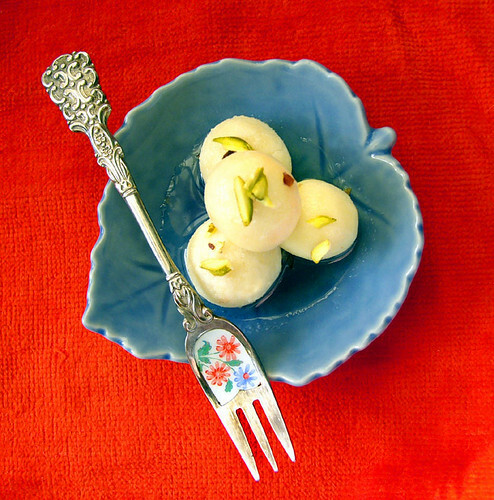 the first dessert was rasgulla: the cold syrup-soaked paneer balls were served as is, with some of the syrup, and a sprinkling of rosewater and chopped pistachios. it was sweet, dense, lightly flowery, lightly nutty. 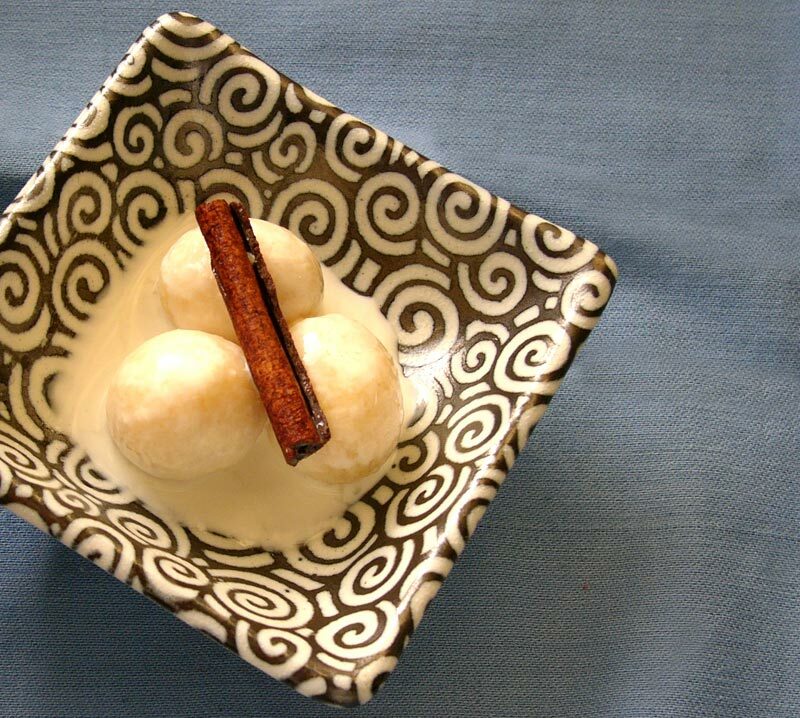 the second was ras malai: instead of serving the paneer with the macerating syrup, i drenched the balls in cream infused with cardamom and cinnamon, then slightly reduced and cooled, along with a splash of orange flower water. 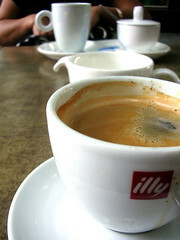 this was fantastically rich, with a surprising bit of heat from the spice coming through the cool cream. although i enjoyed them as these were, it might be interesting to try these warm, with a fine grating of orange zest on top. i'd never had either dessert before; i found the paneer balls slightly firmer than i prefer, but i'm not actually sure what the texture should be like. jeffrey steingarten once complained that these little balls had the texture of "day old bubblegum" (i assumed pre-chewed, but maybe not)--if that's what they are supposed to be like, these definitely fit the bill. i know that proteins toughen up under heat, so i'm wondering if i cooked them for too long; two subsequent batches (one with the addition of a couple tablespoonfuls of flour as suggested by some recipes, one without), proved that a shorted cooking time helpful, but i still found them a bit...bouncy for my liking. i think i would like these to be a bit spongey, but truthfully, i found the warm, just-made ricotta's texture to be really ideal for something like this. my reservations and uncertainties have not set me back; if anything, i am now made more curious, and eager to expand my indian palate, both at home and beyond. i was at the saturday salcedo market this weekend (again), and came across two novelties for me. 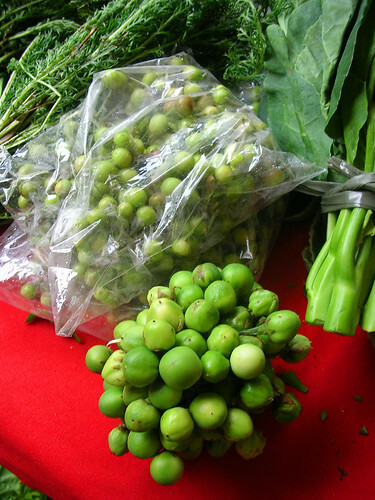 the first (as pictured above) was wild thai eggplant (solanum melongena, solanum torvum, or solanum undatum, i'm not sure. fruit blog, help! 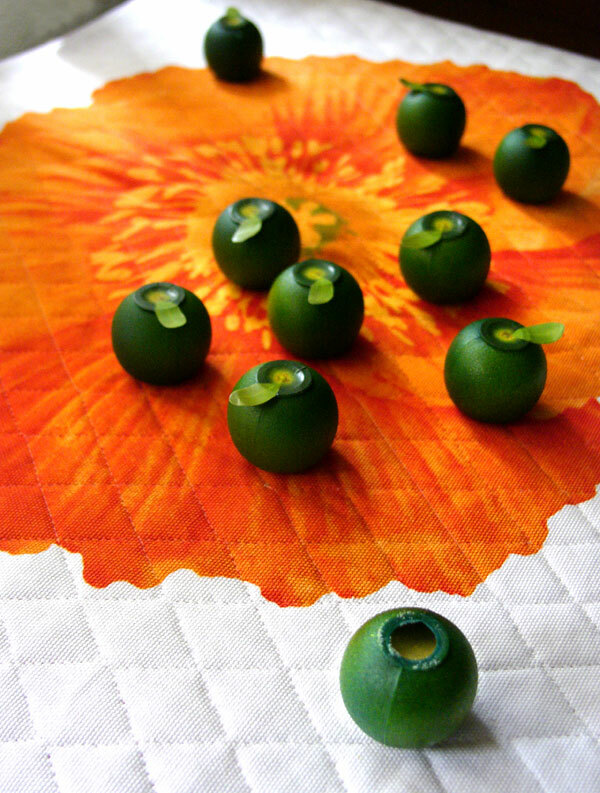 ), some as tiny as capers and the largest no bigger than a centimeter, centimeter and a half in diameter, but assured to be completely edible as is. they were completely appealing to me--little tumescent jade jewels clustered like gaudy ornaments; only joan crawford in her matriarchal PepsiCo chairman's wife years could pull off a brooch like that. i am rarely inclined to cook when i'm in town, but i was so very tempted to buy some; however, i'm at a complete loss as to how these would be best prepared. anybody out there have a recipe for me? 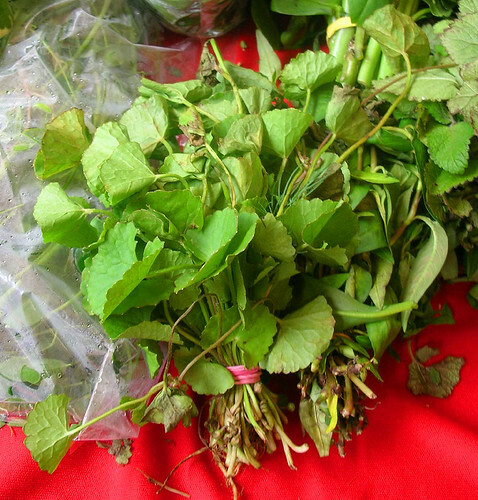 directly beside it lay this fascinating herb that is completely unbeknownst to me. the leaves look like tiny lotus or waterlily pads, and it carries no real scent aside from the greeniness of the chlorophyll. wait. i take that back; it is not completely unfamiliar, as i think i may have seen it amongst the greenery on many a post from the pieman, and special combo affirms the suspicion that it may be used in vietnamese cooking. still, i am unsure. can someone clue me in? garlic at the salcedo market. although garlic (allium sativa)--bawang in tagalog--is a staple in filipino cuisine, and locally grown in the philippines (most notably in the ilocos region), production has decreased steadily in recent years. there are various reasons--from diseases, natural disasters, changing weather patterns, to shrinking acreage, shifting crops, and sadly, importation of cheaper product from other countries. 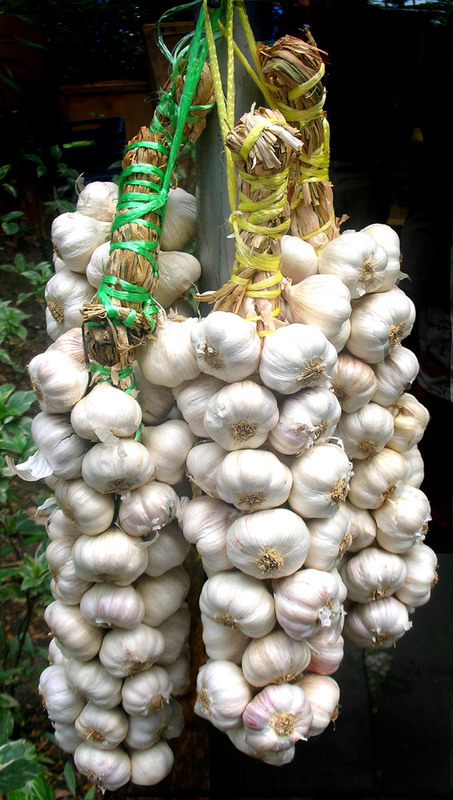 garlic in the philippines is relatively expensive, but because it isn't subject to cold storage, it is far fresher and more pungent than its imported counterparts; as an ingredient, so much less of it is needed. there is a particular flavour to the local garlic that comes from the intense pungency; it is unmatched, even by adding more of an inferior product--definitely quality over quantity. hopefully, with the continually growing interest in the culinary and healing properties of truly fresh garlic, the downward trend can be stemmed, and production in the country will flourish. 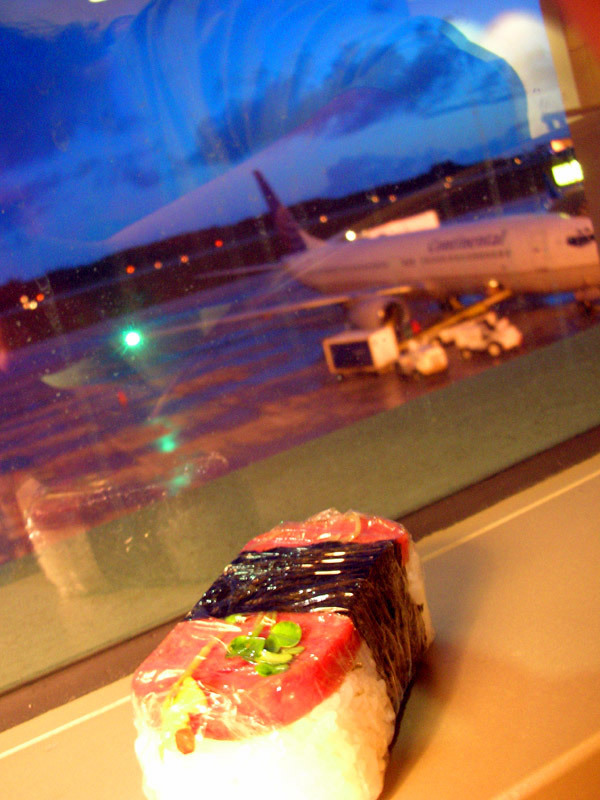 guam airport, now with 50% more SPAM. 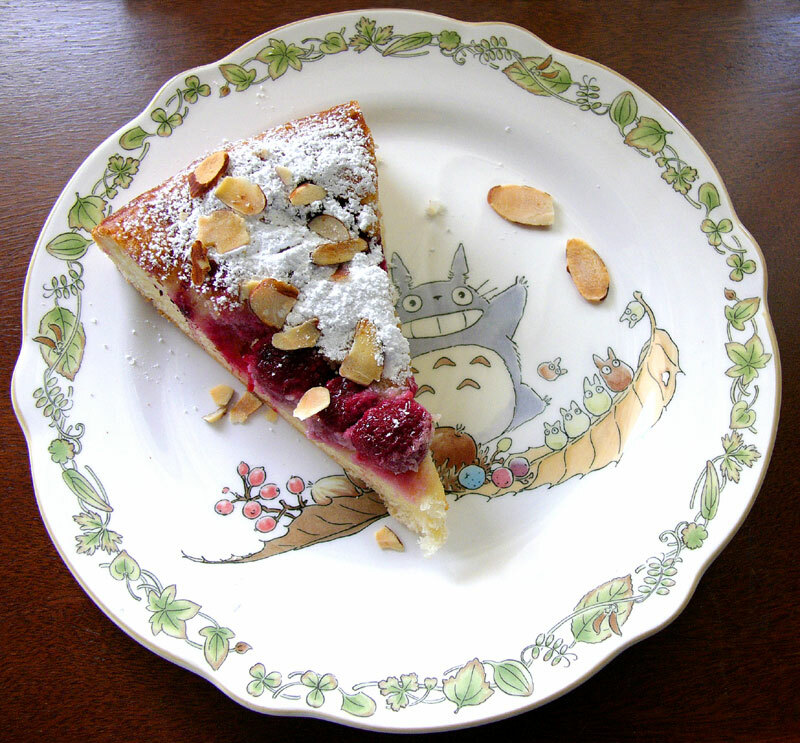 the last (for the moment) of my richard bertinet experiments: fresh raspberries and crème d'amande baked into a sweet dough base, then dusted with a drift of confectioner's sugar and slivered almonds. the original recipe calls for fresh apricots, but i had a few punnets of raspberries that needed immediate consumption, so they make their way on this crostata/danish hybrid. the crème d'amande is made from ground almonds, unsalted butter, eggs and sugar, and is almost as rich as marzipan, but lighter and not as sweet; the same can be said about the dough in relation to brioche. 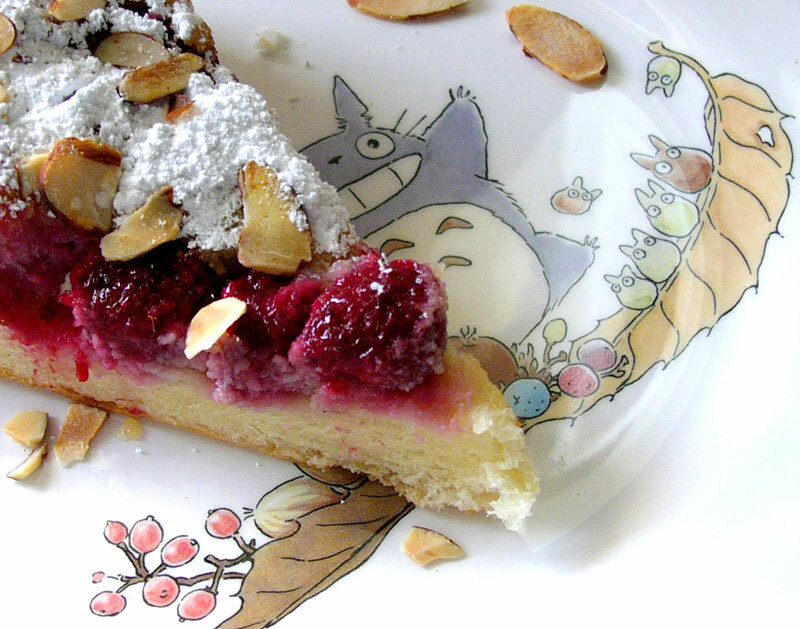 together with the warm raspberries, you create a sumptuous but not-too-guilty any-time-of-day treat. a note: i think i've been putting too much yeast in the bertinet recipes. i tested my scale, and it's a bit wonky; everything i'm baking seems fluffier than in the book. nonetheless, i've been quite satisfied with everything i've tried so far and look forward to the next time fancy strikes. oriental night on the ss president wilson. 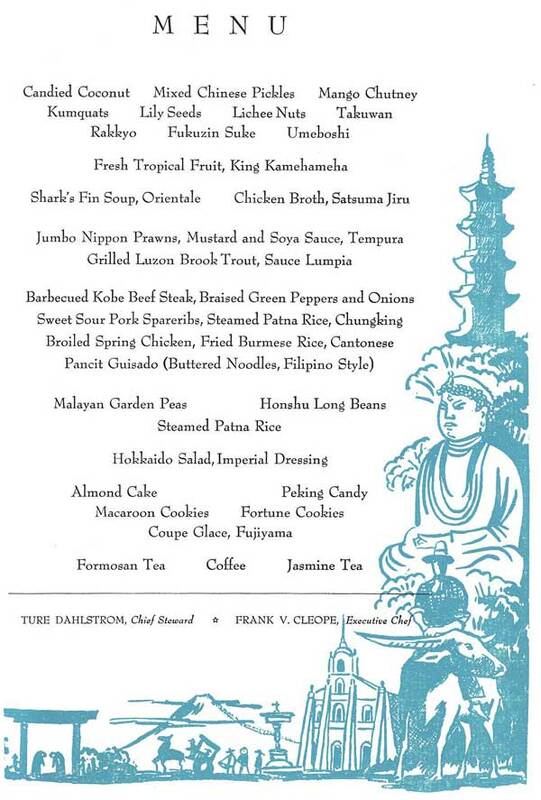 there were actually three ships named the president wilson for american president lines (now a strictly cargo company); this menu is for the second ship, which was the last of the grand passenger liners built for apl in 1948. it toured from the western united states throughout "the far east" until 1973, when it was finally decommissioned and salvaged. 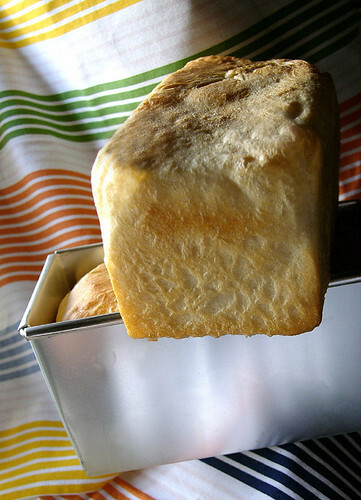 when one of my favourite hotels closed down, some of the things i considered buying in the liquidation sales were the pain de mie/pullman loaf pans from the kitchen. i just think they're cool looking. i ended up not buying any, and i've regretted it ever since, but i balk at paying the price for new ones. the other day, i went to the local restaurant supply shop, and found these cheapy cheap deep loaf pans that mimicked the pain de mie pans perfectly--all i would need to do is cover them with a cookie sheet during baking so i'd get the hallmark square shape of a pullman loaf. so that is what i did. 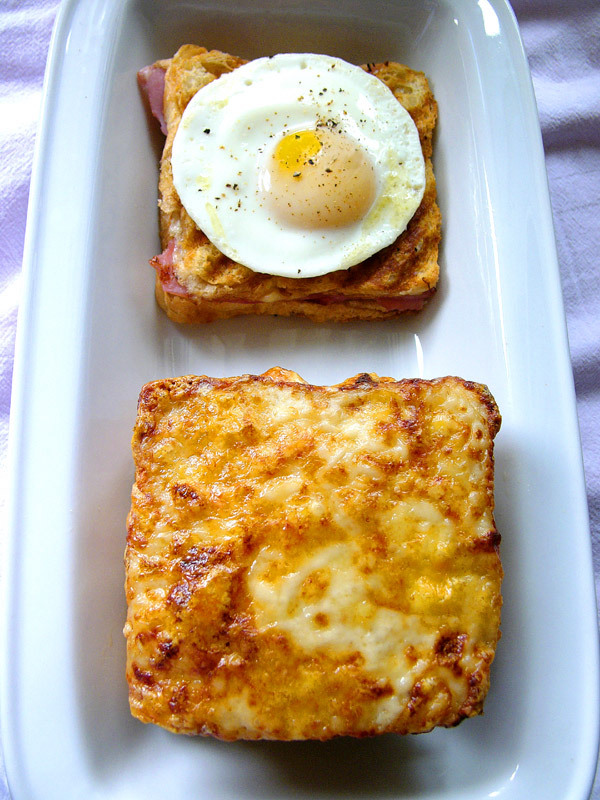 i found a recipe for pain de mie in the richard bertinet book, which included another recipe for what you can do with the bread: croque monsieur, which bertinet describes as a childhood staple in france, and is basically (but gloriously) a grilled ham and cheese sandwich. bertinet's version has thick slices of the pain de mie sandwiching a layer of béchamel, and slices of country ham; the top of the sandwich is then slathered with a thick layer of the béchamel, and a mountain of shredded gruyère cheese is layered on that. the whole sandwich is placed in a preheated 200˚C/392˚F (or thereabouts) oven until the cheese is melty golden brown. i also tried out a recipe for croque madame i found in nancy silveron's sandwich book that i've wanted to try since i saw meg's version a zillion blogyears ago. this version is decidedly more refined, with thinner slices of bread, smoked ham, and slices of cheese instead of the lactose mountain; also, it is grilled rather than baked/broiled. 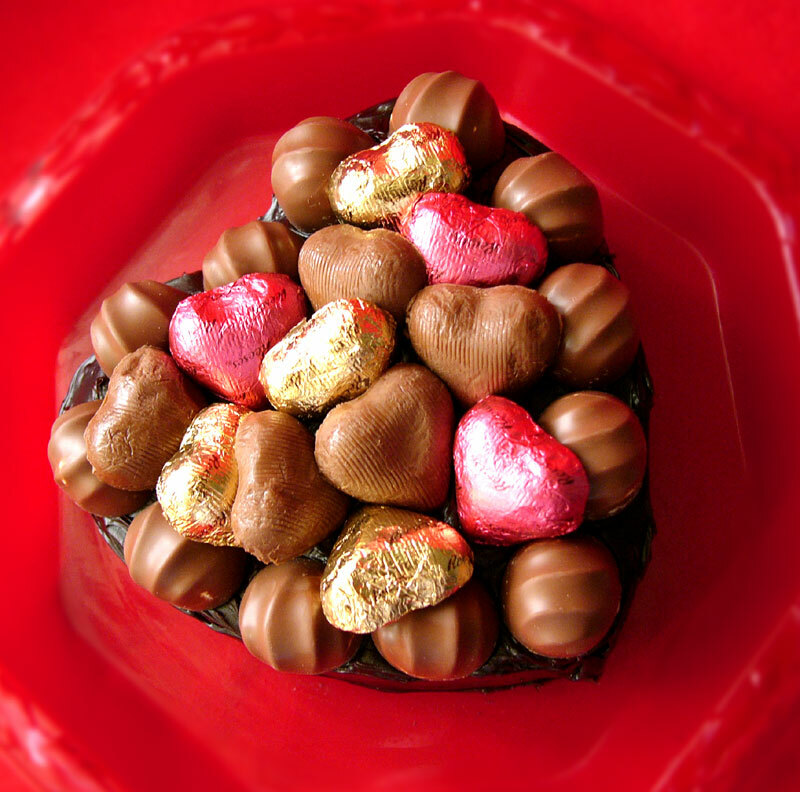 why is it madame to the hearty, brutish monsieur? the egg, of course. sheeeeeeeeeeeesh. a bit french, in that they were a little difficult to eat--runny sauce versus runny egg yolk, chunks of oversized squishy bread or grilled planks that exploded into a shower of crumbs with every bite. but both were a delightfully sensual experience-- warm, creamy, salty, buttery, cheesy...hammy. like brangelina, only with 30% less cheese. a happy pair together. that is, until i ate them. i'm back to the richard bertinet book, so you'll be seeing carbo overload from me in the next few days. these are based on his chocolate bun recipe developed for his son, jack. instead of filling the cocoa-enhanced sweet dough with creme anglaise, i encorporated dried cherries into the dough, the slathered a liberal layer of nutella before sprinkling a layer of mini semi-sweet chocolate chips. these saucer sized luvverlies aren't as sweet or as heavy as you'd think which makes them all the more dangerous. i forget what this is really called, but temari sushi: a super simple way to make sushi at home. 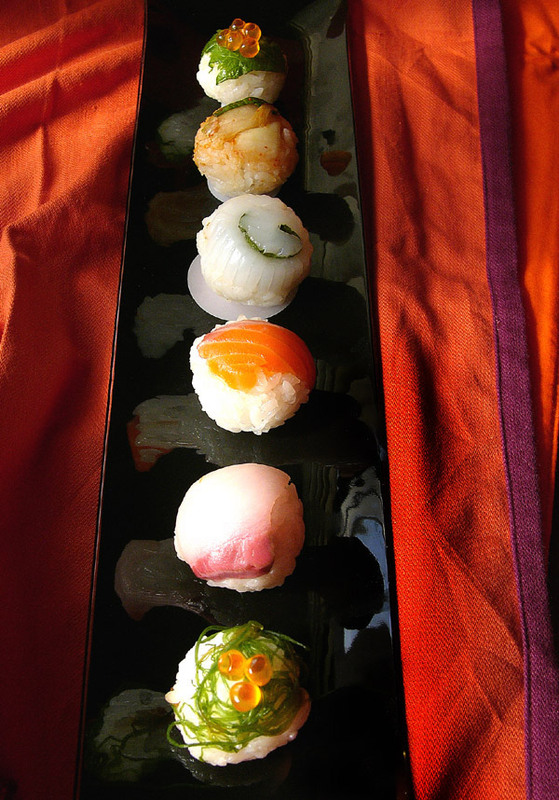 just lay down a square of plastic wrap (or cloth handkerchief, if you must), place your topping in the middle then about 2 tablespoonfuls of sushi rice on top of that. gather the corners of the wrap or hanky, twist, and form a tight ball. sushi! from back to front: shiso (perilla) leaf with ikura (salmon roe), kim chi, ika cuttlefish roll with shiso, sake (salmon), hamachi (yellowtail), seaweed and ikura. if you are wondering why i haven't done a review for a restaurant on guam for awhile, it's because i've decided i need to eat at each establishment several times first--if i'm not going to blog about one specific food item--and especially if i didn't think it totally sucked (which many restaurants of late have--i should really tell you what they are, but eh. maybe they'll improve.). also, i'm really not fond of reviewing restaurants in general. i know my tastes can be suspect. i did, however, promise antoi from adventures of bahn mi, that i'd take photos at pietro's, the newest branch of a large japanese-italian restaurant chain. in honolulu, it's known as angelo pietro's (reid did a review recently), but i guess various locations around asia have variations on the main name. also, it looks like the menu items aren't quite the same (no natto spaghetti here, natch). plastic food! it must be japanese. 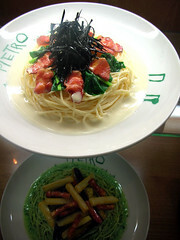 i don't really think of the food at pietro's as eurasian, but as japanese versions of italian dishes, which i fondly refer to as ital-yen cuisine. i'm rather partial to it meself, and luckily there are a few restaurants on island that specialize in it. although there isn't any natto on the menu, you can get takana (japanese mustard pickles), or tarako (cod fish roe) as a pasta topping, shoyu (soy sauce)-based or garlic oil-based sauces, and almost all pastas are topped with nori (seaweed). 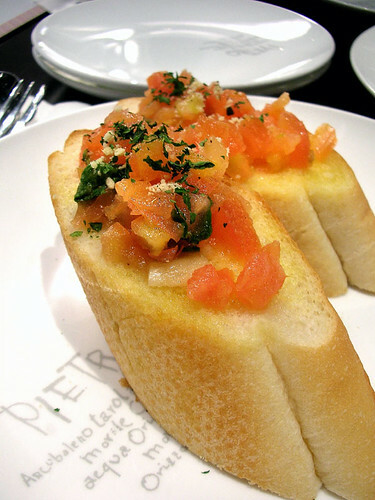 we tried the bruschetta, which was thick planks of french bread, buttered, garlicked, and toasted then topped with chopped tomatoes and something green, which i don't think was basil. might've been, i couldn't tell. some people love this stuff, but i don't think there's any mid-priced restaurant anywhere that can guarantee anything besides watery, cottony, wan tomatoes, so i don't see the point in ordering this, ever (unless it was topped with nori. hmmm. hmmm.) 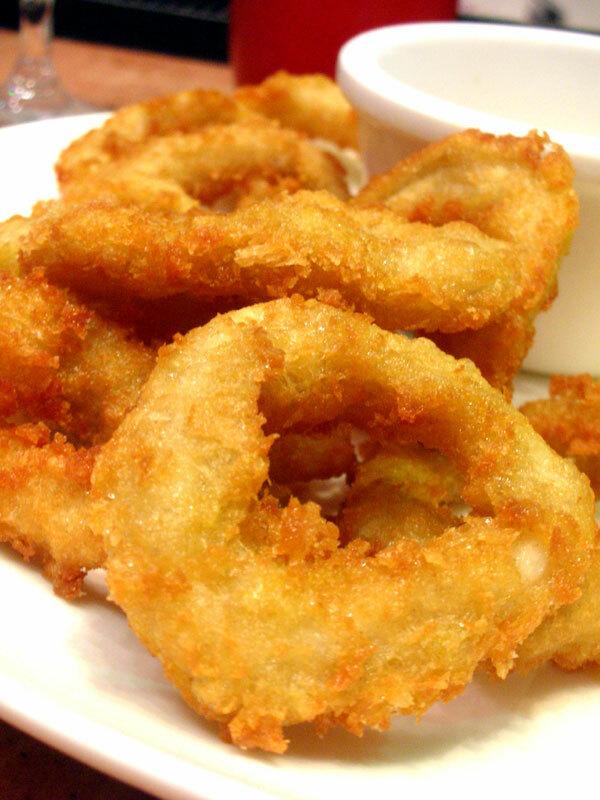 also, i'm not a big fan of fried calamari squid rings, because even though these were fat, crunchy and greaseless on the outside, soft and tender on the inside, and served with a lightly lemony mayonnaise, they don't actually taste like anything. but that's not pietro's fault, that's just the nature of fat squid rings. 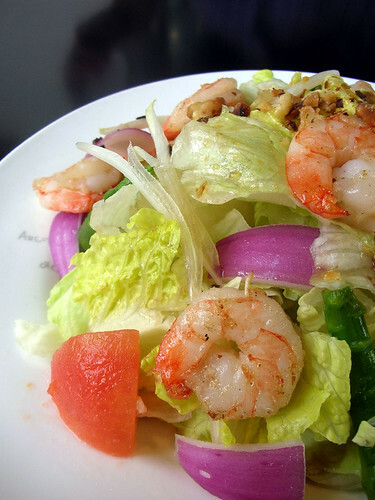 i also had the prawn, (peeled) tomato, and asparagus salad which was comprised mainly of iceberg lettuce, but i don't really have a problem with that--sometimes there's a crunch and bitterness about iceberg that can be a nice foil, as it was with the fat grilled prawns, crispy fresh asparagus slivers, and bits of walnuts throughout the salad. the tomatoes fared better here, as the light vinaigrette that dressed the salad improved them, but the chunks of red onion were a bit too pungent. 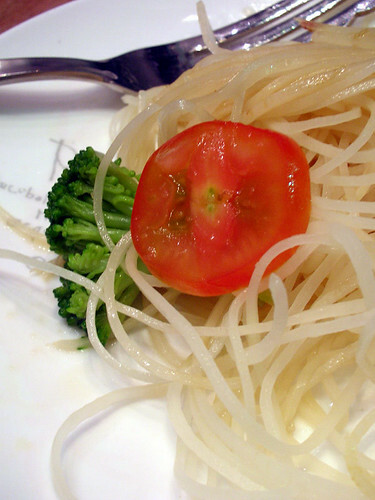 the more interesting salad was the raw potato salad, which was made with impossibly long, thin noodle-like strands of raw potato (made by using something called a potato threader), then soaked in iced water, and marinated in a ginger vinaigrette. this was a great success--light, crunchy, not too starchy, and a nice vehicle for the gingery dressing. yes, you can eat raw potatoes. i'm not entirely sure you'd want to eat a lot of them, though. no, they are not (completely) toxic. see me after class if you want a rundown. i've had a couple of pizzas from here, and they were quite good--the crust is cracker thin and crispy, there is an abundance of cheese, but not so much that it overwhelms the toppings and slides off the crust, and there are enough topping variations to keep you occupied for awhile (but again, no natto!). 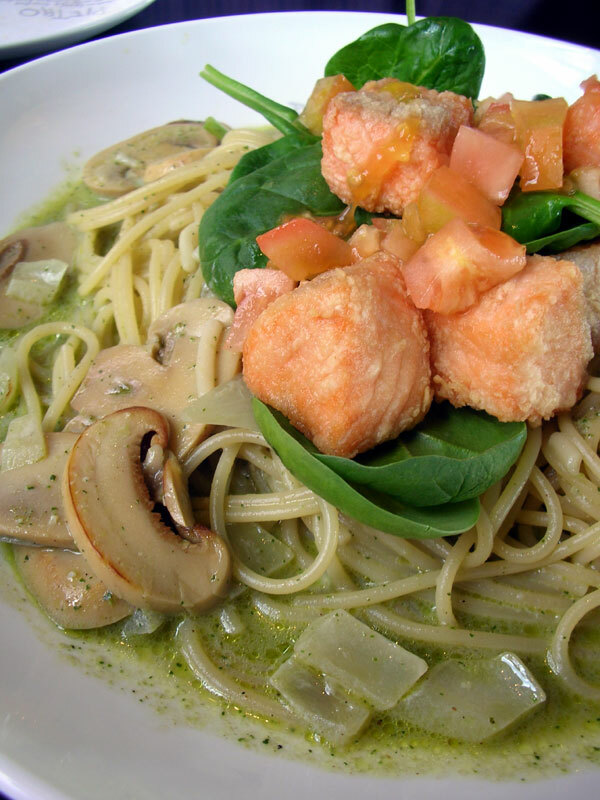 i'm told that the salmon spaghetti with spinach and basil cream sauce is one of the most popular items: spaghetti in a basil pesto cream sauce is topped with fresh spinach and cubes of fat, lightly tempura'd salmon. the flavours of this are quite subtle--i can't really say i tasted the basil in the cream sauce, but the salmon was fresh and perfectly cooked, and the raw spinach leaves helped lift the dish overall. 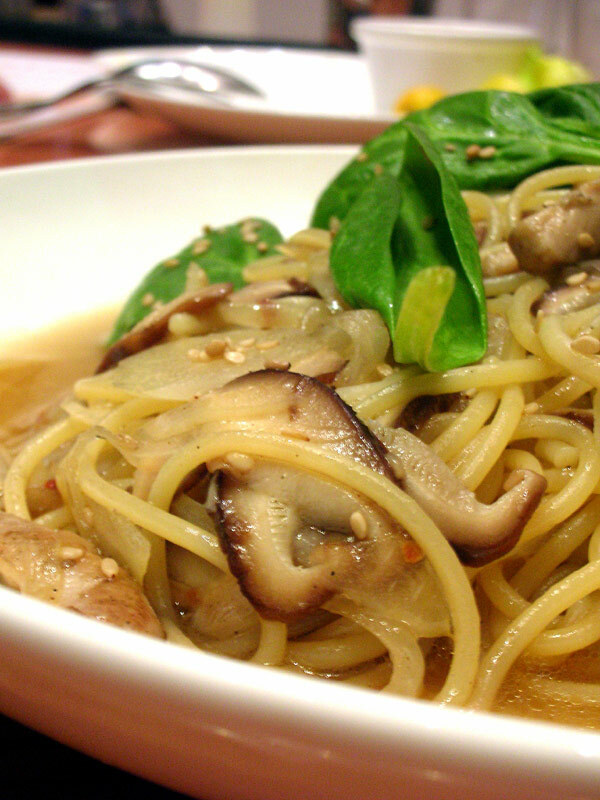 personally, i preferred the chicken, mushroom, and spinach spaghetti in a sesame oil sauce. this was also quite subtle, and the sesame seeds and oil gave this dish more of a chinese flavour. the noodles in both dishes were cooked al dente, and not sticky, but both sauces were rather wet, and the noodles didn't really "drink up" much of the brothiness. lots of flicking lashes from wet noodles, so beware, o ye who wear white in italian restaurants. i think, however, that my favourite items on the menu are the dorias. 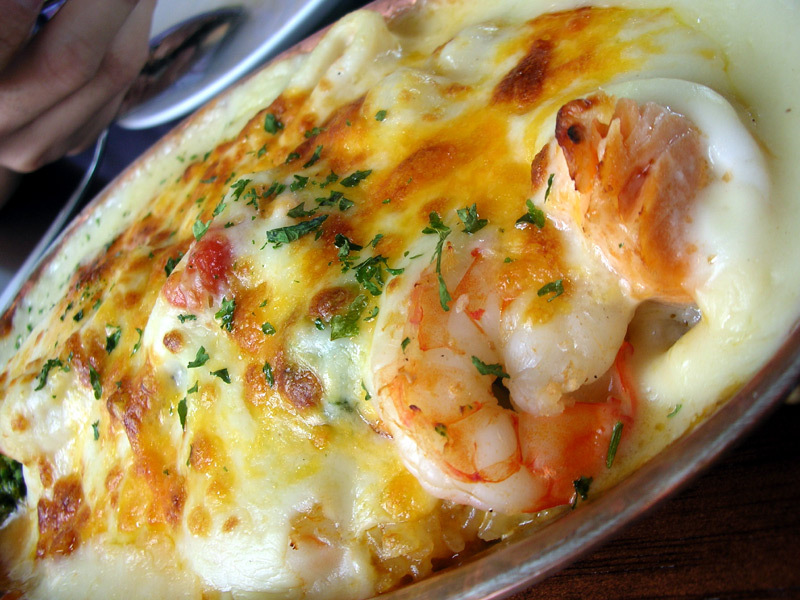 a doria is apparently some sort of rice dish au gratin, with a saucy short-grained rice covered in cheese and béchamel. 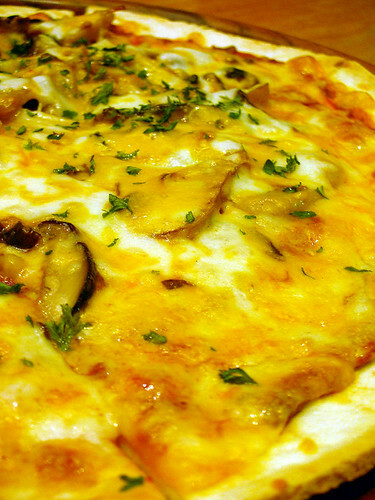 they are creamy and light like a risotto, yet made more substantial by the addition of seafood, vegetables, or meat, then topped with an abundant amount of cheese and white sauce and broiled until brown and bubbly. this one was filled with chunks of salmon, squid rings, and juicy prawns, and the rice was tinged with a wee bit of tomato for taste and colour. excellent. 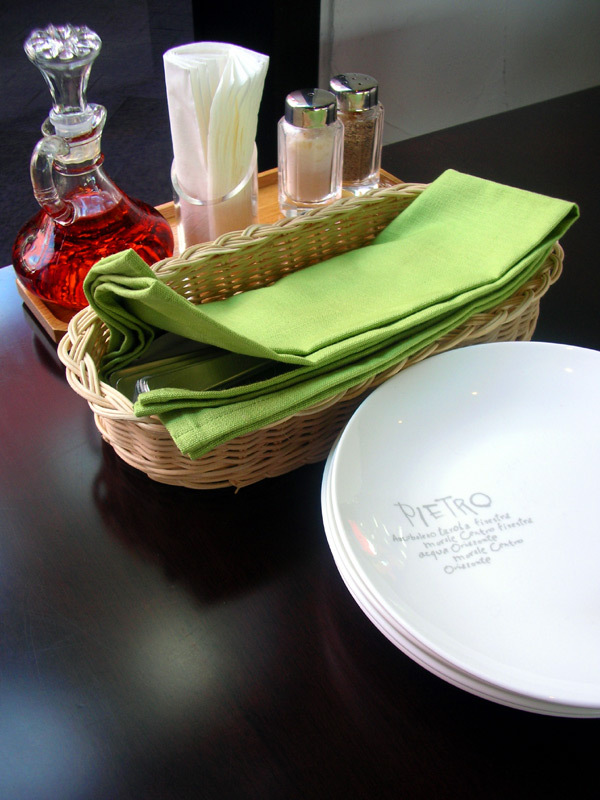 as pietro's is still brand new, the service can be erratic. at lunchtime at its busiest, it was impeccable; at dinner rush, it was almost appallingly bad, but apparently because they were understaffed for the night. i ended up sitting at the bar (my current favourite spot, actually), and being waited on by the cashier, whose genial nature and attentiveness did much to appease me. everyone who works there seems to be quite jovial, and the owner is just a happy, insane japanese guy. who owes me a coffee-flavoured shochu. i mean it. i want it. where is it? 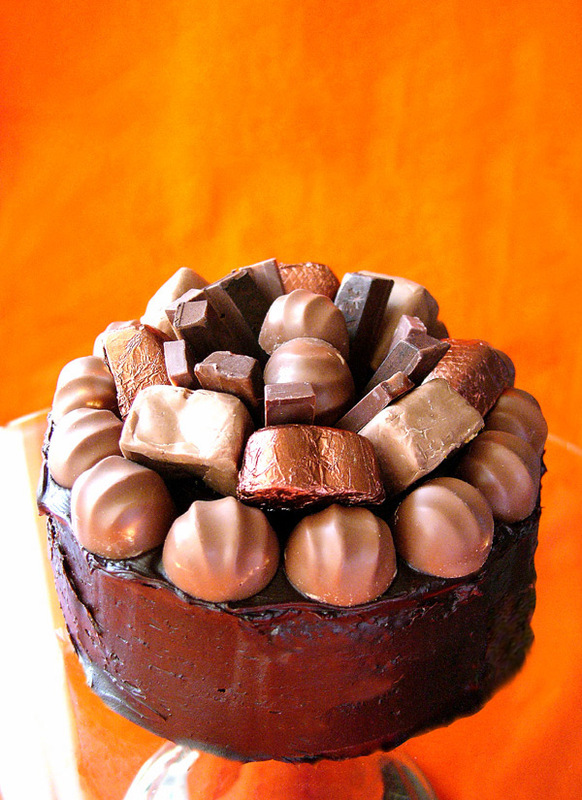 i made this fudgy chocolate layer cake for esa's birthday, and although i know my way around a cupcake, i'm not so good at decorating big cakes--what do i do with all that flat space? i found a solution in those little mini bars of chocolate and boxes of candy i received at christmas that i never eat, even if they are a good brand. just dump a bunch on top (or, yes, artfully arrange), you hide a multitude of frosting misshaps, and someone's bound to be pleased. the cake itself was at once light and spongey, yet moist and fudgy from all the cocoa, buttermilk and coffee. the frosting was smooth and weirdly pudding-like, all chocolate goo and only mildly sweet. for those of you in the philippines that have tried polly's chocolate cake (quite possibly the best cake i've ever eaten that was bought from a gas station), this cake has the same texture and a similar taste, and the frosting is dead-on the same (although it could be the chocolate i used, bought in manila, and frightening cheap--55 pesos, about US$1, a kilo--yet surprisingly good). 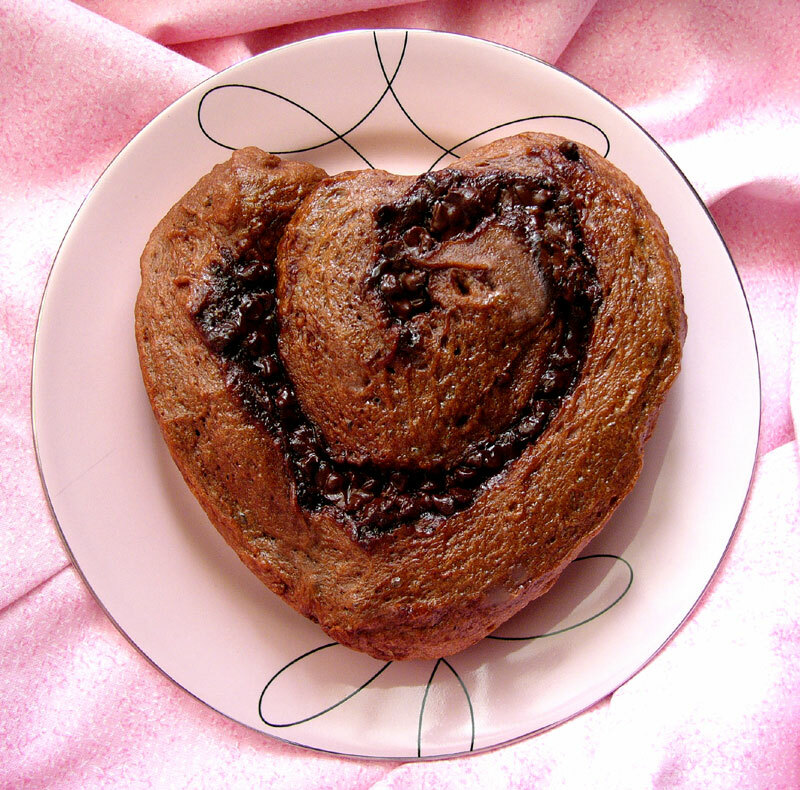 i had a little extra batter left over, so i made another cake, just in time for valentine's day. sweet and simple. kawaii alert! : plastic fantastic calamansi powder. i haven't done a kawaii alert in awhile, so i thought i'd throw one in: little plastic doohickeys filled with single-use servings of calamansi citrus powder, then topped with a paper leaf. 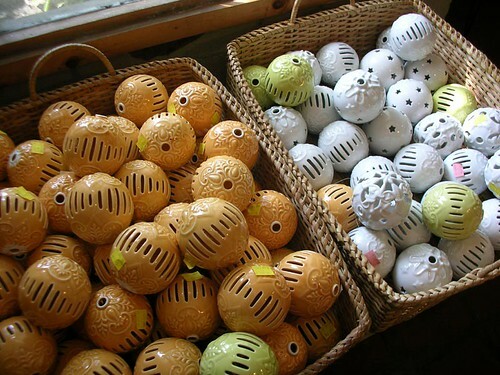 they look like the real thing, only like, cuter. 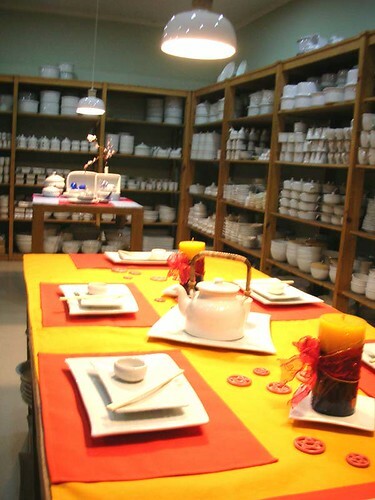 manila: shopping at cardinal ceramics. miss gail once asked me where i find my dishes--of which you've noticed i've an abundance--so i thought i'd let you know about one of my favourite crack dens: cardinal ceramics factory store, tucked in a mostly residential neighbourhood in makati, around the corner from the national shrine of the sacred heart. 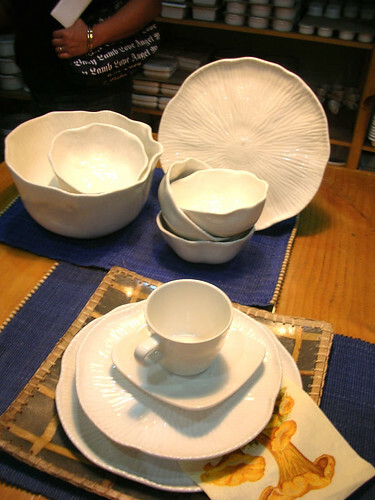 more of a shop of overruns than defective/rejected pieces, it is a hidden gem for bargain ceramic, porcelain and stoneware dishes. cardinal is a local company of fascinating origins and with an interesting history that manufactures wares for international companies like dansk, villeroy and boch, lennox, various house brands (last time i was there, i found a whole line of habitat products), and my personal favourite, restaurantware for hotels (circles at the shang commissioned some very nice pieces, and i just found some crazy random pieces for lawry's prime rib restos). prices are reasonable to downright cheap during sales. 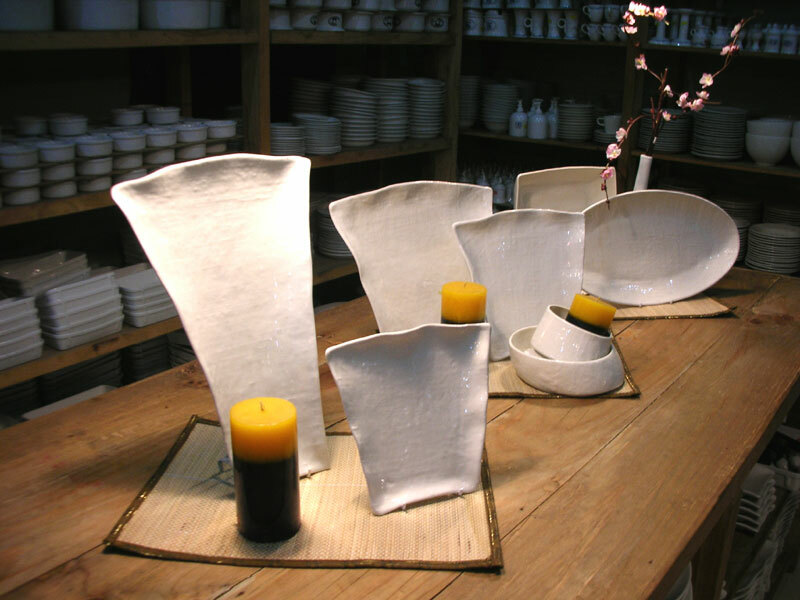 it's a nice place to stock up on basic whites, and they always have an abundance of various leaf patterned plates (banana is the most common, but lotus and gingko appear regularly), but they also have provincial styles (both european and asian), and unusual pieces (my neighbour covets white porcelain hanging pendant light fixtures, similar to those you can just make out here). 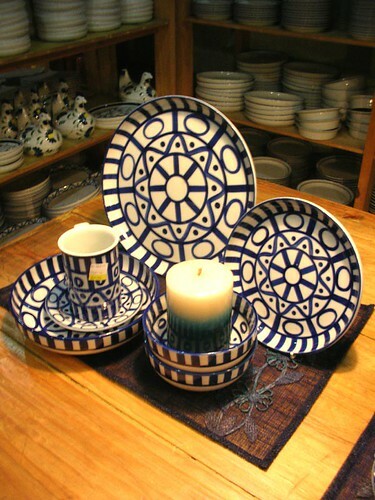 if you are lucky, you'll catch the wares at the end of a firing run and pick up some of the more exclusive pieces. i don't know exactly what their schedule is, but a reliable source tells me i should make some time available at the end of march if i want my table settings to match those of a international "hip" boutique hotel chain's restaurants. stay tuned. i'm contemplating buying some of this line, what do you think? kiat kiat (mandarin orange) trees decorated with ampao, red packets filled with money. 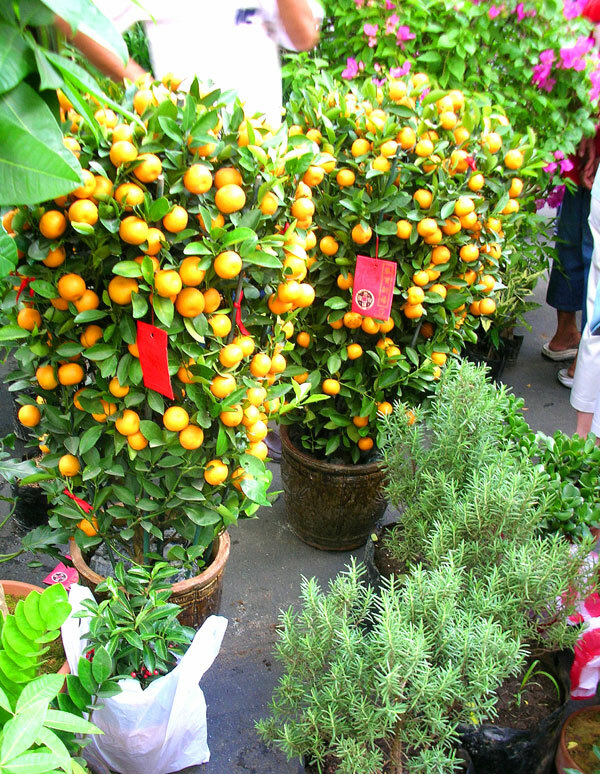 orange trees are considered good fortune symbols in the lunar new year, as the colour is similar to gold. 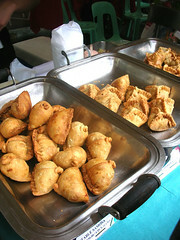 from the saturday market at salcedo village, makati. manila: breakfast at museum café. oh weee remember i had dinner here a few months back? 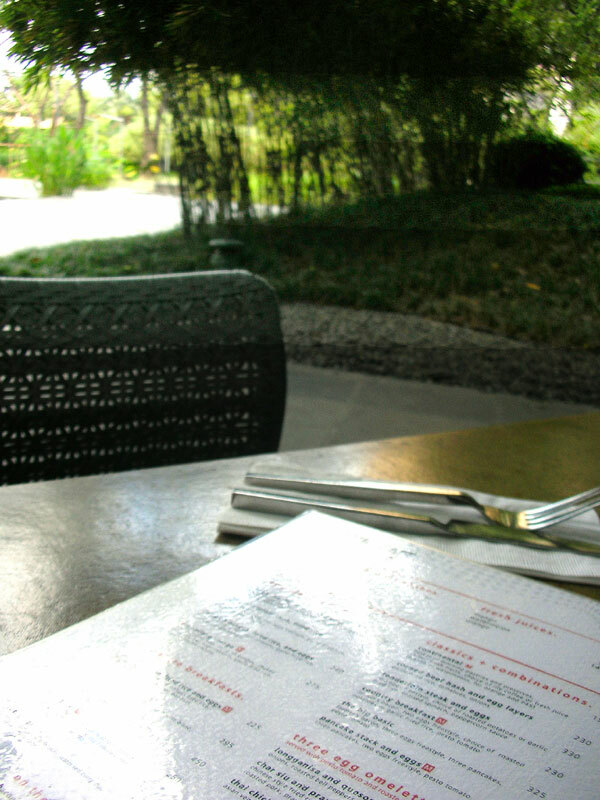 the museum café (m café to one and all), is across the breezeway from the ayala museum in the greenbelt complex, and right smack in the thick of makati traffic, but you'd never know it. ah, how i love urban planning that works. even though it borders a busy avenue, the park beyond is the main focus (although there is a rather lovely view of the museum), and at almost any time of the day, a sort of housey jazz accompanies the breezy atmosphere with bamboo thickets and shady trees filled with capiz lanterns swinging gently around and overhead. i'm completely romanticizing things, i know, but sometimes i am just happy to pretend, and even happier when it's made easy to pretend. so yes, it may be overrated, and expensive, but i like the unobtrusive service, some of the food, and of course, the great location. anyway, how bad could they f**k up a pancake? 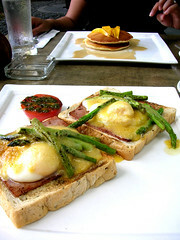 we sat outside, and started off with a cuppa coffee--which was lovely, smooth, not packing a big punch--then took joey's advice and ordered the m benedict: two poached eggs, chinese ham and grilled fresh asparagus on linseed toast with a hollandaise sauce. i asked the waiter if i should pay the extra and go for the smoked salmon, and he almost immediately said no. i don't know if it wasn't to his taste or if he just didn't think it was worth it, but i was pretty happy with my choice. the eggs were overcooked, the asparagus was not, and although the hollandaise looked oily, it actually wasn't (i think the dish was broiled a bit before serving). linseeds, what are linseeds, i associate them with laxatives and furniture finishing, but the bread was nice--slightly nutty, sweet, and light. overall, it was the lightest benedict i'd ever had, i didn't feel like i needed a nap afterwards. ms. p had the pancakes with fresh mango and maple syrup, and huzzah! they were fluffy, light, and absolutely did not intrude on the mangoliciousness of the fresh fruit. 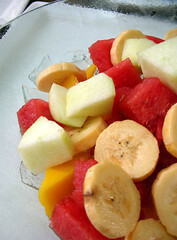 we also split a generous bowl of fresh fruit--local watermelon, bananas, and mango with granny smith apples from...somewhere--which were served on a bed of ice chips that kept the fruit crisp and cool throughout our meal. overall, i thought it was a success. 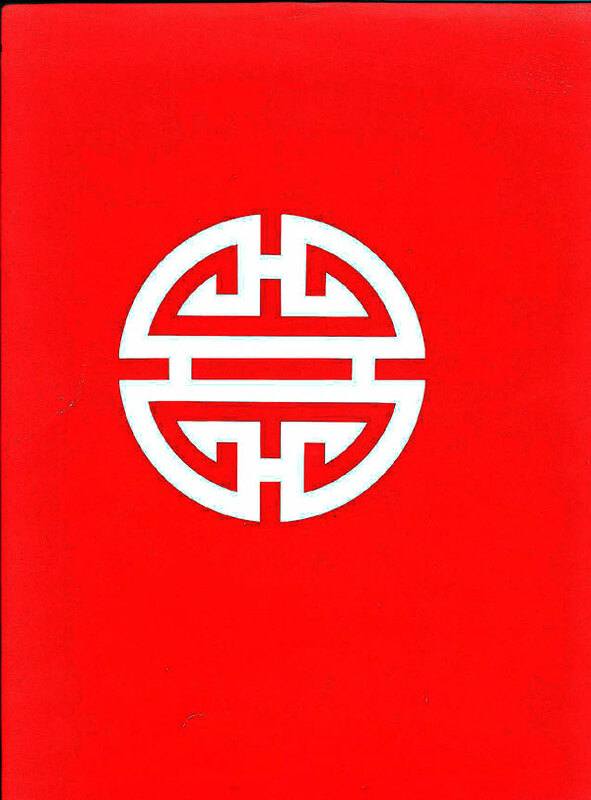 the atmosphere is so relaxing, and the food tasty enough, without being stodgy or leaden. the menu is rather eclectic--you'll find western standards (eggs, pancakes, waffles, bacon), pinoy standards (tocino, longganisa, bangus), some asian specialties (green curry, char siu), and a quite a few interesting combinations: longganisa (sweet, spicy sausage) and quesong puti (native white cheese) omelettes, thai chicken omelettes, peanut butter and banana waffles...okay, that's not interesting, but it's good. satisfying, yet leaves you room to eat more later. sooner than you think.